Cuts to crucial services are jeopardising the health of England's children, nursing leaders are warning. The Royal College of Nursing highlighted figures showing reductions in the numbers of school nurses and health visitors. The union said government cuts to public health budgets - held by local authorities - were to blame. The Conservatives say they are protecting children's health, with over £3bn spent on public health last year. A spokesman for the party said the government had published a "world leading" child obesity plan, while investment was being made in child mental health. "We are focused on protecting the health of our children," he added. But this has been strongly disputed by the RCN, which says health visitors and school nurses are "critical" to the agenda. A four-year plan to boost health visitor numbers began in England in 2011, but the union fears that progress is now being undermined. Figures show there are just over 2,500 school nursing staff, down from 3,000 in 2010 - a drop of 16%. Health visitor numbers have gone up since 2010, when they stood at 8,000, thanks to a targeted programme to recruit more. However, the numbers are still 1,000 down on the high of just over 10,000 seen in 2015. RCN general secretary Janet Davies said: "Cuts to these critical services risk not only the health of our children, but also the future of our country. "There's a wealth of evidence that ill-health in childhood can have a detrimental impact in adulthood. "If these cuts continue, we're heading for more health problems, more inequality and even more pressure on our public services down the line." Councils get funding from the Department of Health to run public health services. The funding has been cut in each of the last three years and by 2020 the grant is expected to be 10% lower than it was in 2016. It comes after the RCN, which is holding its annual conference in Liverpool, unveiled research showing an overall shortage of all types of nurses in England. 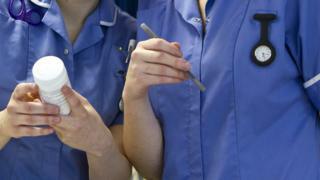 It found there were about 40,000 unfilled nurse posts - double the number in 2013. The problems elsewhere in the UK were less severe, the union said. Labour is promising a new child health fund, to increase school nurse and health visitor numbers.